HMS Albion (L 14) - Portsmouth, 15/09/2007. HMS Albion (L 14) entering Portsmouth harbour, 3/10/2007. The Plymouth-based amphibious assault ship HMS Bulwark has returned to the operational fleet after the completion of essential maintenance work which saw her taken out of front line service for 12 months. Following the maintenance work, which has greatly enhanced Bulwark's capability, the ship completed seven weeks of basic operational sea training under Plymouth-based Flag Officer Sea Training staff which culminated in a major amphibious exercise in Cornwall and Dorset. "HMS Bulwark has greatly benefited from her basic operational sea training and I am delighted that she is back where she belongs in the operational fleet. We are all looking forward to our forthcoming programme." During Exercise South West Sabre the ship carried 150 Commandos from 42 Commando Royal Marines (Plymouth) 29 Regiment Royal Artillery (Plymouth), and Commando Logistic Regiment (Chivenor, N Devon). 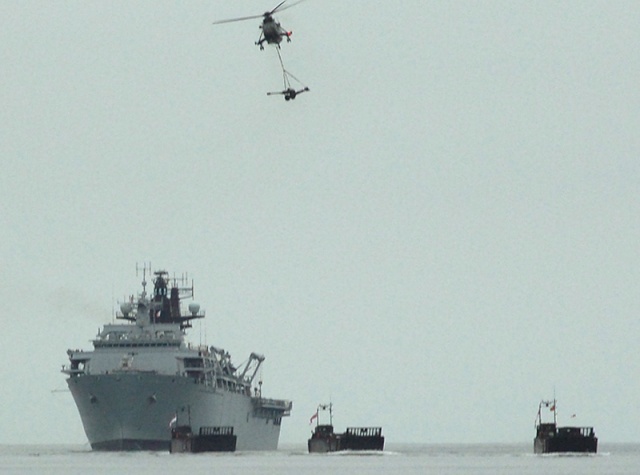 Bulwark launched a series of mock amphibious raids and assaults on simulated targets in Pentewan, Cornwall, and Lulworth, Dorset, using her own landing craft and Sea King helicopters from 845 and 846 Naval Air Squadrons. 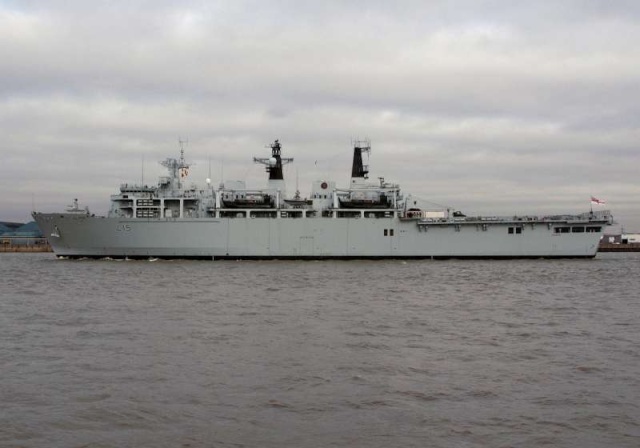 HMS Bulwark was supported by the German frigate FGS Rheinland Phalz. Bulwark's next task is in London later this month where she will support the launch of the Royal Naval Presentation Team's autumn tour and conduct a range of other public events. 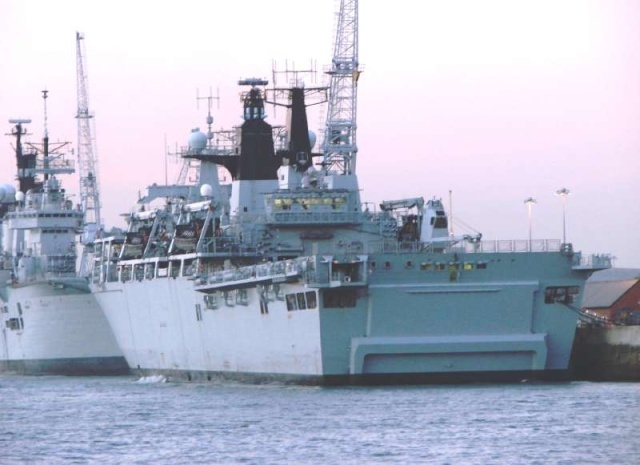 She is then due to take over from her sister ship HMS Albion as the amphibious flagship of the Royal Navy fleet in December 2007 prior to acting as the flagship leading a task group during February 2008's amphibious exercise in Norway. HMS Bulwark is the Royal Navy's newest commando assault and command and control ship. Launched in November 2001 she has a ship's company of 390, a quarter of whom are made up from 4 Assault Squadron Royal Marines. 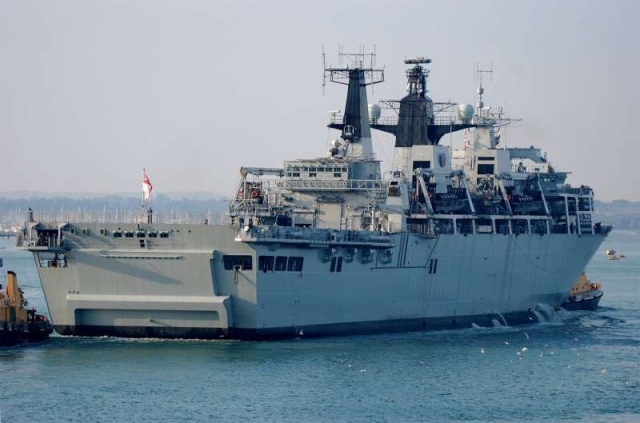 She can also carry up to 700 troops and her flight deck can land two Chinook or two Merlin helicopters. A large floodable dock holds four large landing craft, with another four carried on davits on the ship's side. HMS Bulwark (L 15) inbound for Greenwich at Woolwich, Nov 7th 2007. Royal Navy amphibious warship HMS Bulwark arrives in Greenwich today (Wednesday 7 November 2007) and has an action packed programme during her five day visit. The 160 metre long assault ship will host a number a visitors and take part in a number of high profile events during her stay in the capital. 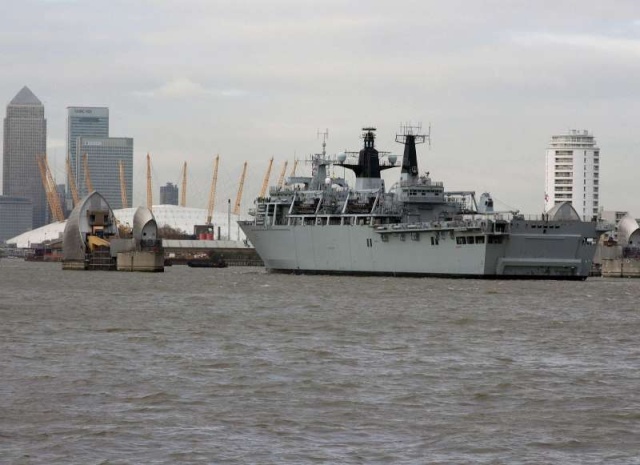 On Wednesday, HMS Bulwark’s Commanding Officer, Captain Jeremy Blunden, will welcome on board the Mayor of Greenwich, Sajid Jawaid, and his deputy Steve Offord, along with Commodore Jim Patrick, Naval Regional Commander for Eastern England and representatives from investment bank Goldman Sachs and local firefighters. During her stay, the ship’s company will host visits from a number of groups including members of the Association of Dunkirk Little Ships and guests from Greenwich Hospital. And some of the crew will also get a chance to display their sporting prowess when they play a football match against a team from Greenwich University. On Remembrance Sunday, Captain Blunden will attend the City of London Remembrance Service to be held at St Paul’s Cathedral, which will also be attended by His Royal Highness, Prince Michael of Kent, Commodore-in-Chief of the Maritime Reserves. The ship’s visit culminates on Monday with the launch of the new Royal Navy Presentation Team’s (RNPT) autumn tour programme. Using the latest technology to take the audience inside warships, submarines and aircraft, the RNPT tours the country with their multi-media road show, demonstrating the vital role that the modern Royal Navy plays in world affairs. 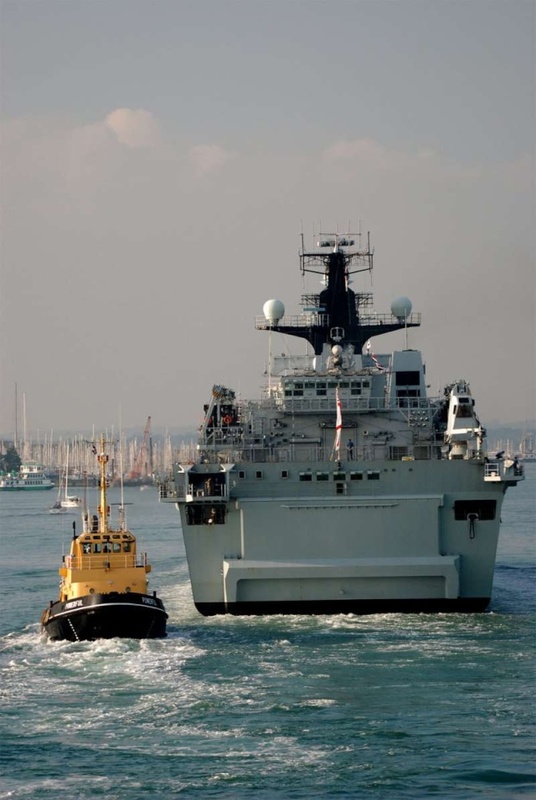 Bulwark represents 18,500 tonnes of nautical muscle, capable of transporting troops, equipment and aircraft to trouble spots anywhere in the world. She is a prime example of how the Royal Navy is currently benefiting from a £14 billion investment package with the largest warship building programme in 20 years. In the past decade the Fleet has taken delivery of 28 new ships and one new submarine. Bulwark is joined by a further six new specialist amphibious ships – her sister ship HMS Albion, helicopter carrier HMS Ocean, and four Bay class RFA ships have doubled the senior service’s capacity to move both the Royal Marines and equipment of 3 Commando Brigade. Captain Blunden said, “I am delighted to be bringing Bulwark to Greenwich for the first time, and am extremely proud to be here over Remembrance weekend. I think it is essential that we all take time to reflect on the epic sacrifices made during the World Wars and indeed subsequent conflicts. The men and women who have given so much for us are owed our utmost respect and gratitude. 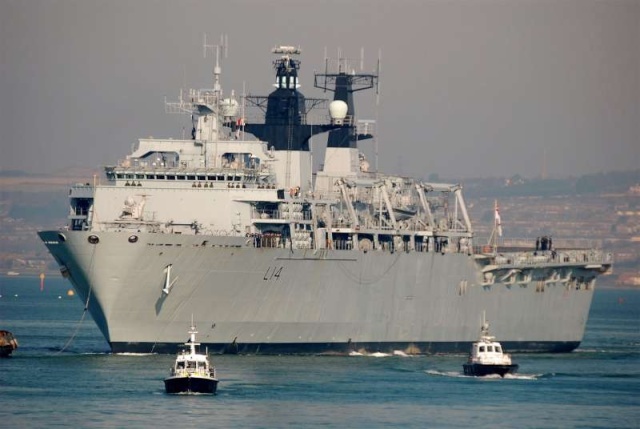 HMS Bulwark is an amphibious landing ship capable of embarking, transporting, deploying, sustaining and recovering troops with their equipment and vehicles. She is also an afloat Command platform, fitted with the most modern combat support system, permitting embarked Commanders to direct operations at sea and ashore. With organic landing craft and an embarked squadron of Royal Marines, HMS Bulwark is a highly versatile platform able to operate across the full spectrum of defence activities in support of Joint expeditionary operations. Bulwark is in the city for a 6 day visit and will take part in the Lord Mayors show and the Remembrance Ceremony on Sunday. 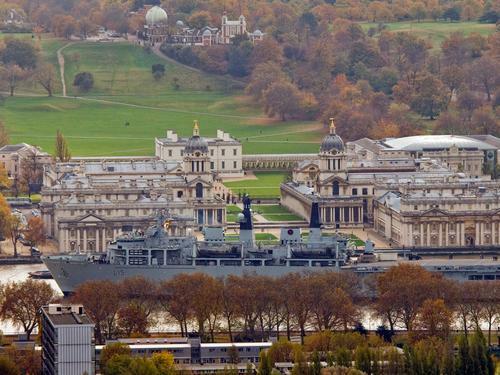 HMS Bulwark has completed a busy 5 day visit to the capital city. During a packed programme sailors and marines from the 20,000 ton amphibious assault ship, which was berthed at Greenwich, carried out a range of representational functions as well as taking the opportunity to enjoy some well earned shore leave after the ship’s recent period of Basic Operational Sea Training. Bulwark played host to members of the MOD’s Strategic Interest Group (made up of key executives from the media, industry and commerce) and the Commander of the Royal Saudi Navy, who all took the opportunity to be briefed on the ship’s capabilities. The ship also played a series of sporting fixtures against the Metropolitan Police Force with mixed results! During Remembrance Weekend, the Commanding Officer, Captain Jeremy Blunden, attended a service at St Paul’s Cathedral and then laid a wreath on behalf of the Royal Navy at the City of London War Memorial. Meanwhile the ship’s chaplain, the Reverend Tim Wilkinson, officiated at the Service of Remembrance that took place in the chapel at the Old Naval College in Greenwich. Many members of the ship’s company took the opportunity to attend Remembrance Sunday events across London and marched with veterans at the Cenotaph. Finally Bulwark was also the venue for the launch of the Royal Naval Presentation Team’s autumn tour; hosted by the First Sea Lord; over 150 members of the public took the opportunity to be briefed on current maritime and defence issues. 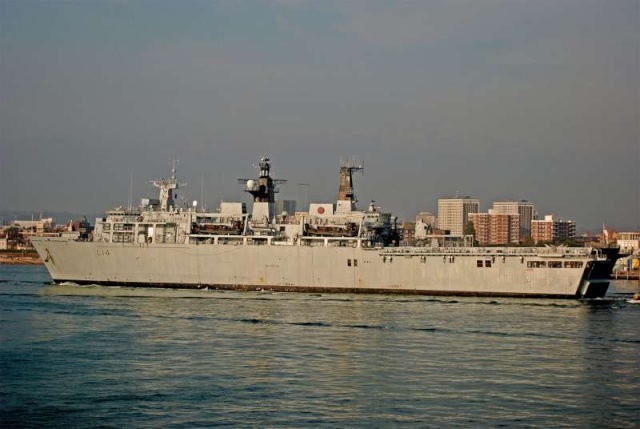 Bulwark now returns to her base port of Devonport where she will undertake a short maintenance period prior to assuming the role of Amphibious Fleet Flagship from her sister ship HMS Albion. 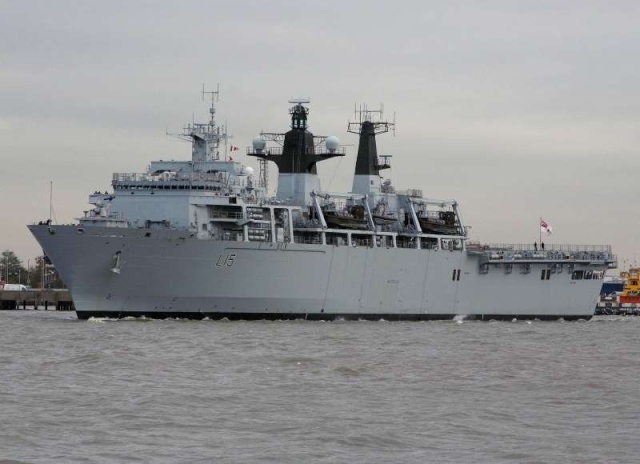 Bulwark will deploy to Norway for a large amphibious exercise in late January. 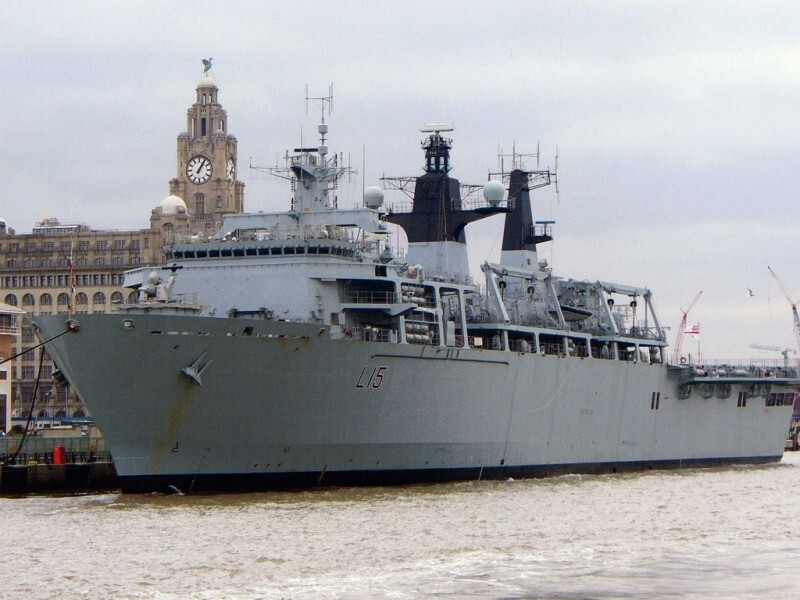 The Plymouth-based amphibious assault ship HMS Bulwark has enjoyed a successful four-day visit to Liverpool – the newly-crowned European City of Culture. An exotic visitor berthed at the cruise liner terminal in the shadow of the famous Liver Building, HMS Bulwark attracted considerable attention from residents crowded onto the jetty to see one of the Royal Navy’s newest and most capable warships. 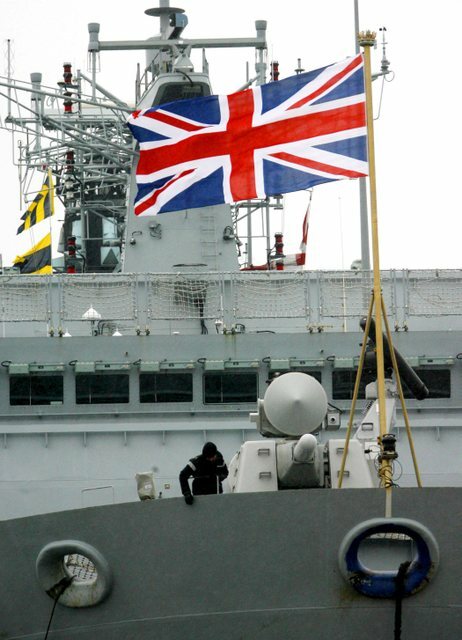 HMS Bulwark also played host to visits from Liverpool groups and organisations including Sea Cadet Units, schools, Royal Naval Association Branch, Mersey Naval and Maritime Society and World Ship Society. The crew also played several sporting fixtures against Liverpool teams. The assault ship is sailing in company with Plymouth-based HMS Cornwall and is flying the flag of the head of the Royal Navy’s Amphibious Task Group Commodore Peter Hudson. 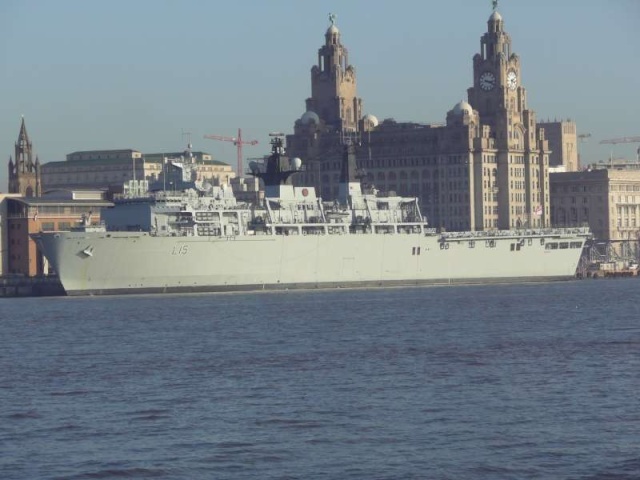 HMS Bulwark and HMS Cornwall stopped in Liverpool en-route to a multi-national exercise amphibious in Norway called Armature Borealis 08. 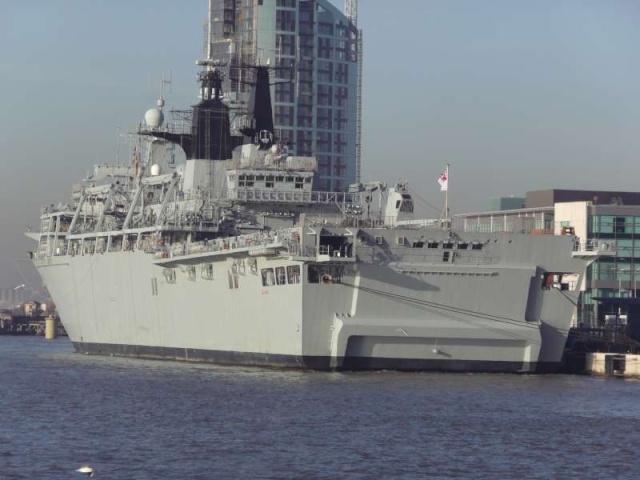 HMS Bulwark is planning to return to Liverpool later this year to join in the city’s Battle of the Atlantic celebrations. HMS Bulwark is the Royal Navy’s newest commando assault and command and control ship. Launched in November 2001, she has a ship’s company of 390, a quarter of whom are made up from 4 Assault Squadron Royal Marines (4 ASRM). 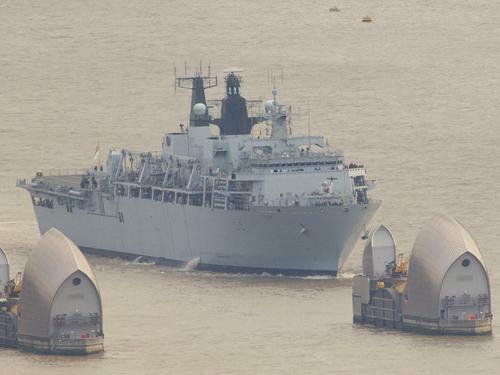 The ship can also carry up to 700 troops and her flight deck can accommodate two Chinook or two Merlin helicopters. A large floodable dock holds four large landing craft – with another four carried on davits on the ship’s side. HMS Bulwark (L 15) at Liverpool, 12/02/2008. HMS Albion (L 14) leaving Portsmouth harbour. 18/02/2008. 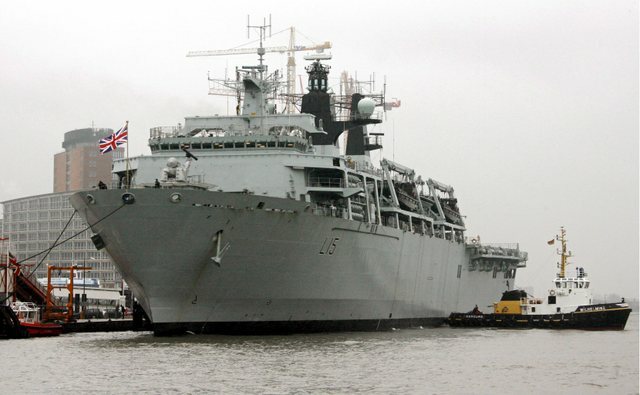 British Royal Navy's Dock Landing Ship 'HMS Bulwark' in Hamburg, Germany, 14 March 2008. 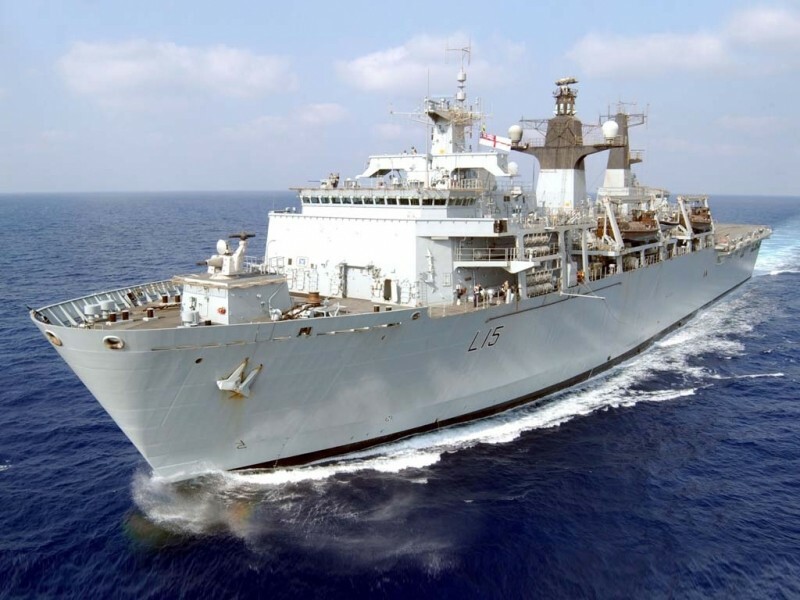 The 411 crew members strong HMS Bulwark is the Royal Navy's latest dock landing ship launched in November 2001 and put officially into service on 10 December 2004. Her biggest deployment to date occured in the beginning of 2006 when she was deployed to the Horn of Africa in the Enduring Freedom mission. 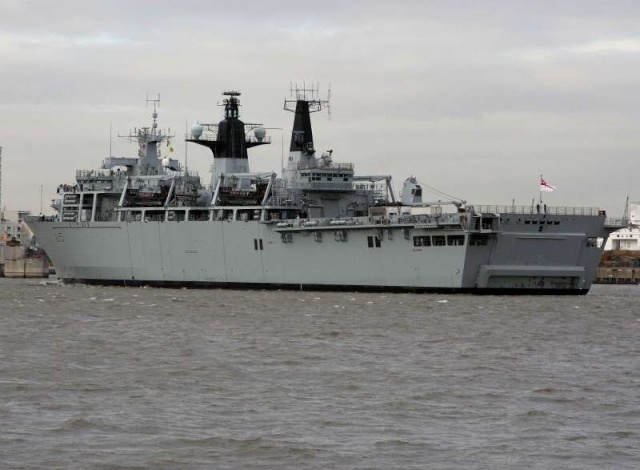 The 320-strong crew of Royal Navy warship HMS Bulwark will take a well earned break on Merseyside this weekend (9-12 May 2008). 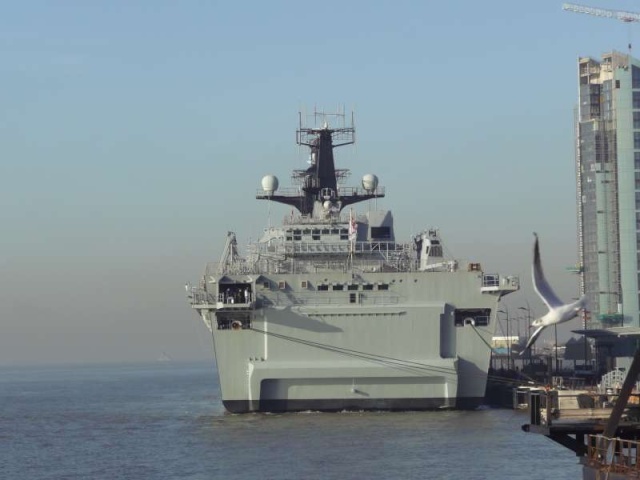 The 176 metre long amphibious assault ship will berth alongside the Cruise Liner Terminal for the second time in three months and has an action-packed programme during her four day stay. Whilst alongside, the ship will play host to the rousing music, visual splendor and military precision of The Band of Her Majesty’s Royal Marines, who will perform a charity concert on Saturday evening for around 600 guests on Bulwark’s Vehicle deck. Their repertoire covers every category of music including jazz, pop, classical, light concert music and the big band sound. 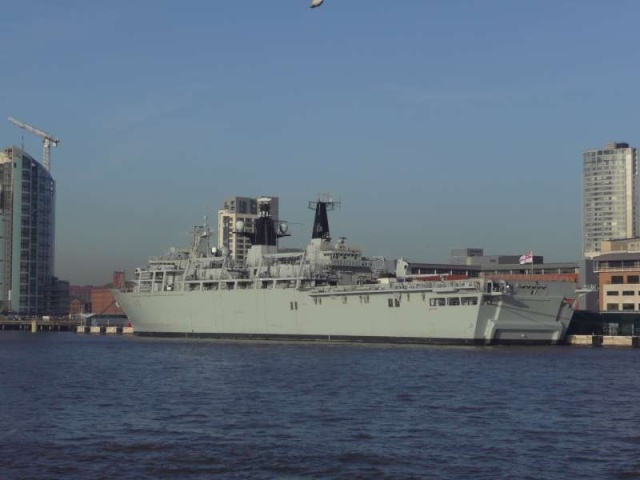 HMS Bulwark will also throw open her gangway to the general public on Sunday, 11 May from 12.30pm to 5.00pm. This is a chance for visitors to meet the ship’s crew and learn more about life on the ocean waves and what it is like to live and work on board a warship. Admission is free. HMS Bulwark’s Commanding Officer, Captain Jeremy Blunden, said: “I am delighted to be bringing Bulwark back to Liverpool so soon after our last visit. The ship has just completed a major NATO exercise off the west coast of Scotland called Exercise Joint Warrior, involving sea, air and land assets from more than 17 countries and so we are looking forward to a welcome break before resuming our busy programme. “Liverpool is an extremely popular port visit for the Royal Navy due to the hospitality of the people and the vibrancy of the city and my ship’s company are excited about the visit. 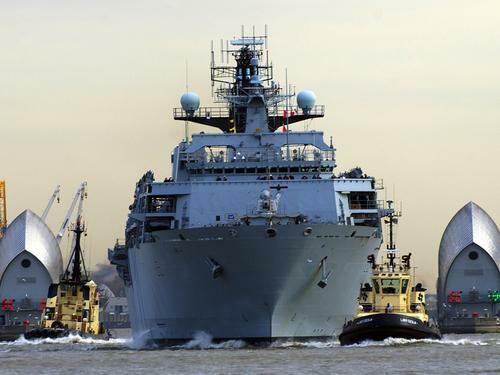 HMS Bulwark is an amphibious landing ship capable of embarking, transporting, deploying, sustaining and recovering troops with their equipment and vehicles. She is also an afloat Command platform, fitted with the most modern combat support system, permitting embarked Commanders to direct operations at sea and ashore. With organic landing craft and an embarked squadron of Royal Marines, HMS Bulwark is a highly versatile platform able to operate across the full spectrum of defence activities in support of joint expeditionary operations.